the whatley wild days: Cowgirls Rule! Here we are with our Cowgirl Party! 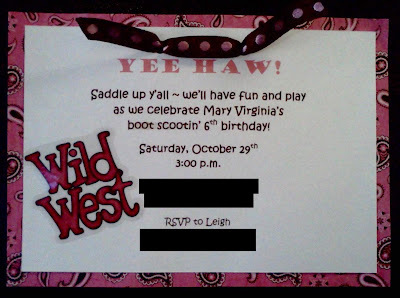 I wouldn't have expected anything else from Mary Virginia! I am going to brag...I did make this cake and I am very proud...it actually looks like a boot! The S'mores were the hit of the party! John Bay and I made these. I have a feeling that we will be having these at all of our family functions from now on! Get ready, they are yummy! This is how the spread looked...Cowgirl Cake, S'mores, Trail Mix, Haystacks, and Gold Nuggets! The kids loved it! To go along with the bounce house, we had a pony corral. The kids could rope the "pony" with the hula hoop lasso! Also a hit, but the kids decided it was more fun to ride the sawhorse pony than to try to rope it. They wanted to lasso each other instead! The kids had fun playing in the bounce house and dressing up like cowboys and cowgirls! It was such a fun party. The only thing missing was a real horse!